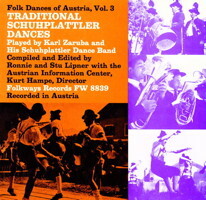 Information: Ronnie and Stu Lipner, teachers and producers of folk dance books and records. Dances of the World's Peoples. New York: Folkways Records and Service Corp. A collection of pamphlets about folk dances and songs. Folk Dances of the World's People. Folkways. Vol. 1  Greece, Romania, Bulgaria, Macedonia, Croatia. 1958. 6p. Vol. 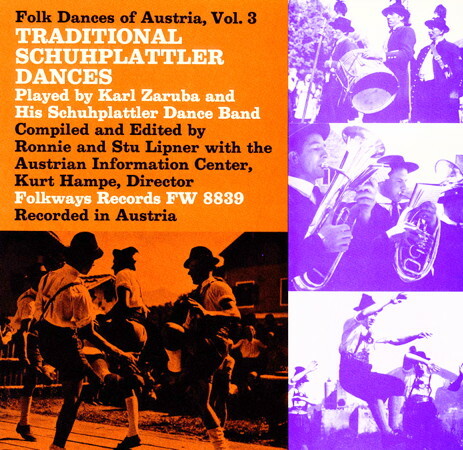 2  Europe Folk Dances. 1958. 6p. Vol. 3  Caribbean and South American. 1958. 6p. Vol. 4  Turkey, Israel, Greece, Armenia, Caucasia. 1958. 6p. Vol. ?  American Indian Dances. 1961. 6p. Vol. ?  Argentine Dances. Folkways Records FW 8841-8842. 1958. 2 33 1/3 rpm 12". 16p. Illustrated, diagrams. Vol. ?  Dances of Austria. New York: 1959. 8p. Illustrated. Vol. ?  Dances of Spain. 1959. 5p. Illustrated. Vol. ?  Dances of Venezuela. 1958. 10p. Illustrated, diagrams. Vol. 1  Dances of the Balkans and the Middle East. Folkways FD 6501 (FD 1801). 1957. 33 1/3 rpm 12".